Mere days remain until the 18th annual NASA Great Moonbuggy Race! As we continue our exploration of moonbuggy mechanics, we turn to the drivetrain. And immediately Dennis Gallagher, our race expert and NASA astrophysicist, puts a weary hand over his eyes. “Chains,” he says. It sounds like a curse word. 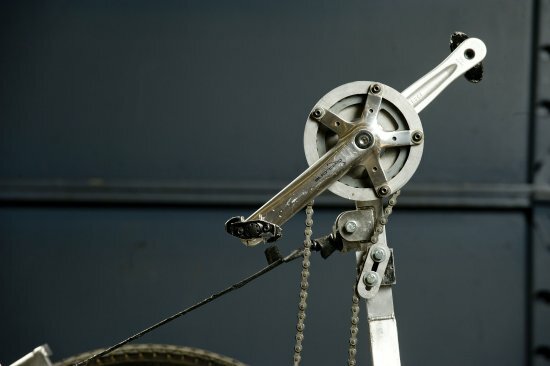 What constitutes the drivetrain? Get on a bicycle or dirt bike and look down, Gallagher says. The drivetrain is basically everything between the rider’s feet and the road, including pedals, gearing, axles, tires and wheels. 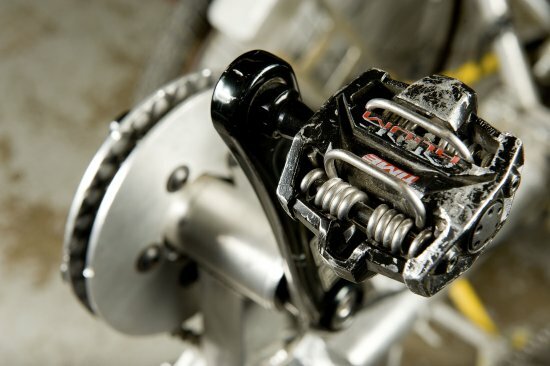 The drivetrain system transmits human power from the riders’ madly pedaling legs to the drive wheels of the vehicle. Most also have a gearing system to convert speed and torque. 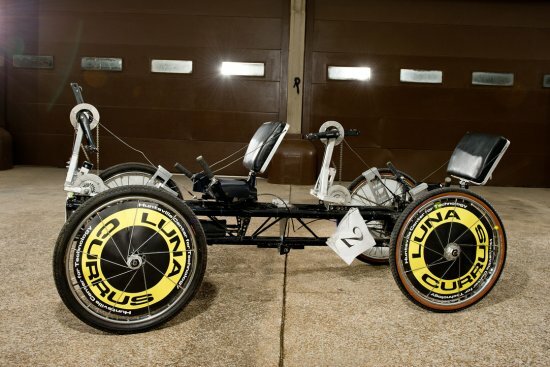 Typically, moonbuggy drivetrains come in two flavors, says Tom Hancock, the chair of the American Institute of Aeronautics and Astronautics Alabama/Mississippi section and a longtime member of the Great Moonbuggy Race planning committee. There’s the fancier, direct-drive system — which employs a driveshaft and transmission to transmit torque and rotation — or a simple series of gears. His lament is a common one on the track. Chains can spell doom out here, where drivers see the jut and angle of obstacles ahead and over-exert themselves. In recent years, one of the most common sounds on the course (after the fire-whistle wail of the starter’s horn, the whoops of the kids from Lima and Middle Tennessee State, and the boogie-inspiring percussion of the Puerto Rico teams’ drums) has been the grinding SNAP! of an over-tensioned chain breaking on the very first mound of thick, wet gravel. And if the chain hasn’t snapped outright, chances are it was too loose… and slipped off the gear teeth. Goodbye, momentum. “You’re putting a lot of stress on this system,” Gallagher says. “The buggy is human-powered, but it’s really not like a bicycle at all. A rider’s legs can put upward of 300 pounds of force on each pedal with each stroke.” Add a second rider, a lot of adrenaline and awesome prizes and bragging rights at the end of the track… and now there’s nearly 1/2-ton of force hitting those chains on every obstacle. “Standard bike chains cannot put up with that kind of force,” Gallagher says. Gallagher concurs. He also emphasizes caution to those teams who employ derailleur gears — a kind of variable-ratio transmission system that includes a chain and sprocket system to change gears and widen the range of torque and power that can be applied. But being able to change gears to increase speed shouldn’t be the ultimate goal, he says. Because of all the turns and obstacles, the fastest buggies on the course usually only clock about 15 mph on straight sections. “It’s a challenge,” he says. “On straightaways, you want gearing conducive to speed. On harder sections, you want gearing conducive to torque.” But he believes the best vehicles maintain a fairly steady top speed across the course, without a lot of gear changes. For others, their delicate drivetrain elements were never designed to take the kind of punishment doled out by the NASA Great Moonbuggy Race. Rounding out the drivetrain portion of our buggy tour are the points where the rider meets the ride and the rubber meets the road: pedals, wheels and tires. The pictures represents not just machines and the brilliance of the scientists in Nasa even when it comes to amusing competitions like the NASA Great Moonbuggy Race! This is what I refer to as high competetive spirits.